Some oil and gas producers are showing signs of weakness and despair. “Almost every person is high-yield junk” – Michael Milken. “You only find out who is swimming naked when the tide goes out” – Warren Buffett. “Many pee inside the swimming pool but very few do so straight from the diving/spring board” – The Fortune Teller. Junk-rated bonds (HYG, JNK, AWF, BKLN) of energy (XLE) companies are under-performing again. What’s behind the broad-based decline among junk-rated energy bonds recently? Investors are looking at the fundamentals & they don’t like what they see. 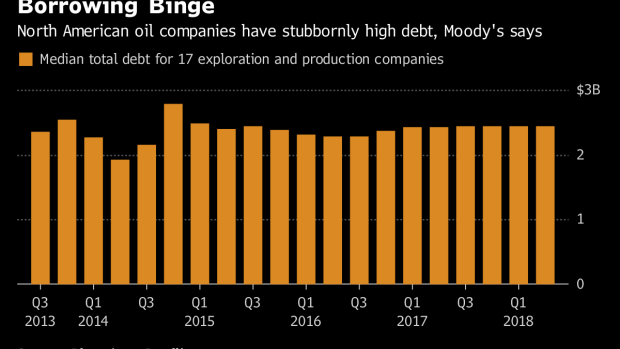 The most dramatic example of this is the 7.75% 6/15/2021 debt of Weatherford International (WFT), which is plunging after the company came out with disappointing earnings. 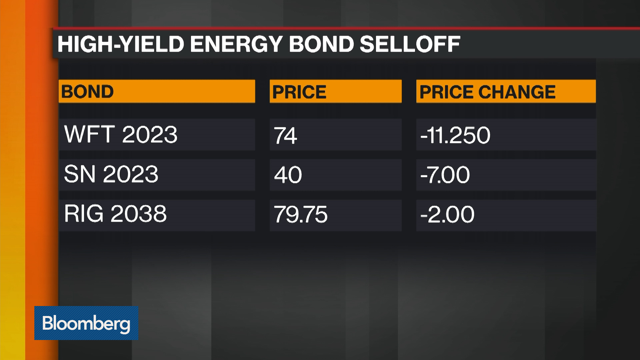 Another good example (for a bad debt) is Sanchez Energy (SN) that sees its 6.125% 1/15/2023 bond falling quite a bit. Btw, SN just released its Q3/2018 earnings too, and it doesn’t seem like the results are going to do any good for the bond. Energy companies that are buying their shares back have outperformed, so far, this year. The gap (out-performance) is massive – about 26% over the past year. It’s safe to say that if you are an oil and gas producer – you better run a repurchase program ASAP… Unfortunately, not everyone can. 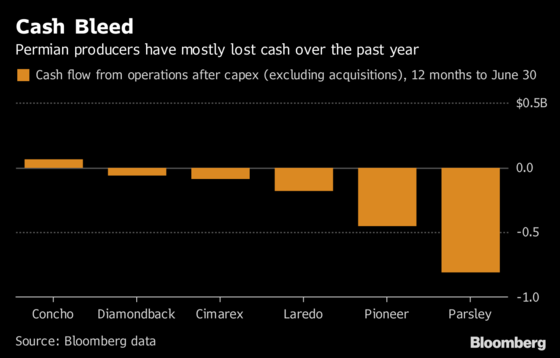 With debt levels remaining that high, many (mostly smaller) producers can’t afford “wasting” money an anything which isn’t crucial to their ongoing operations. 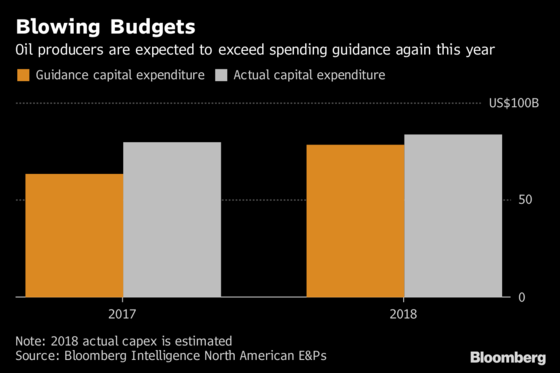 Not to mention that for the most part, capital spending is coming ahead of guidance, adding even more pressure to the already-stretched cash flow. Investors are right to be concerned when North American oil and gas producers seem to be delivering the wrong type of growth: too much production (oversupply) at a time where prices are declining, spreads are widening* and, very simply put, they don’t have enough cash. 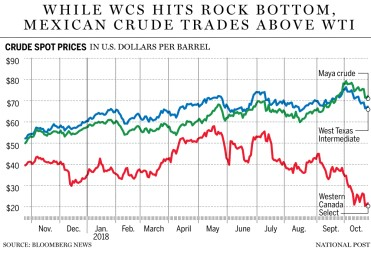 *Note the huge difference between U.S. (SPY) WTI to Canada (EWC) WCS oil prices (USO, OIL), whereas the price gap (of the US) with Mexico (EWW) is much smaller. Many shale explorers, earlier this year, have pledged to change course – reduce spending and engage more in buybacks. 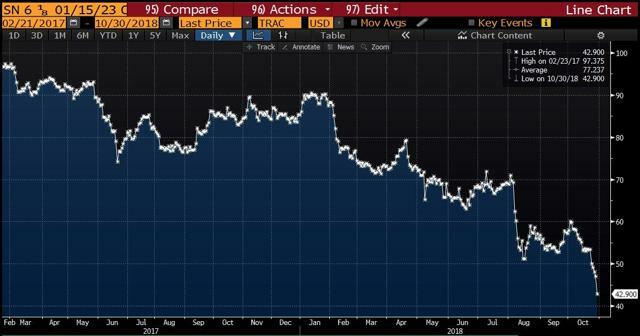 The selloff in energy junk bonds suggests that the pain of 2014-2016 wasn’t enough to weed out the weakest links in the US shale patch and beyond. 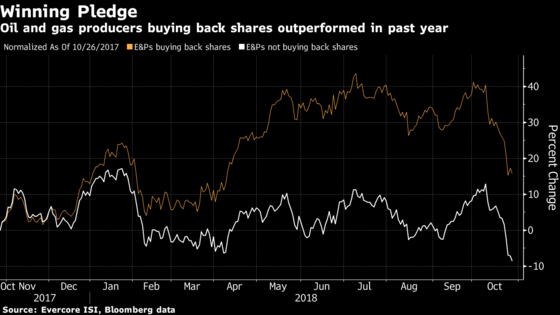 While in the first quarter, dividends and share buybacks were two of the major theme across the energy sector, now that many producers already blew through their capital spending budgets, there is much less planning and much more hoping. Q3/2018 earnings will reveal whether the industry can adhere to its much-touted – and urgently needed – plan for more discipline. If you don’t believe Michael Milken, take a closer look at Owens & Minor (OMI). It’s not an energy company but after 19 years of dividend increases has cut its dividend by 71.2%! Time To Rethink Your Bond Holdings? This entry was posted in Distressed Debt 1 Hedge Fund, Durig Capital Complaint, Durig Capital Customer Feedback, Durig Capital Destressed Debt Hedge Fund, Durig Capital feedback, Durig Capital Fixed Income, Durig Feedback on November 9, 2018 by Randy.